Over the past several weeks and months, I've felt like all we have received is bad news. Time after time, we were praying for good news, and every time the result was bad... until yesterday! Finally, a prayer that we were praying, God answered in a very obvious way. I went to the doctor for my follow up appointment after surgery and everything has healed and is back to 100% normal in record time! Week after week, I was setting records for the longest miscarriage the office had ever seen, so it was an amazing moment when the doctor told me that I've now set a record for the quickest D&C recovery! Praise the Lord!! While I was in that sonogram room yesterday, God reminded me of something that brought me peace. He reminded me that He has been with me for the entire 21 weeks that this has been going on. He was in there on the first day of treatment. He was there on the day my pregnancy was confirmed. He was in that room on the day the doctor told us that your brother or sister was no longer alive. And although it didn't feel like it, He was there every single time the nurse had to tell me that the miscarriage was still lingering. And yesterday, He was there when the doctor was finally able to give me some good news! God was there! I might have a love/hate relationship with that sonogram room, and I might not always feel like God is there, but I am so thankful that He is! I am beyond thankful that regardless of how huge my faith is on any given day, He will always be in that room with me!! On another note, I have some even better news for you! There is a book that I can't wait for you to read one day. It's called the Bible!! I pray every day that the truth in this book would change your life in the same way it has changed mine and daddy's. Sometimes I forget how interesting the Bible can be, but then I remember that God is the best author there is! Today, I read the book of Esther for the first time in years, and it just reminds me over and over again that God's providence is beyond anything that I can imagine. 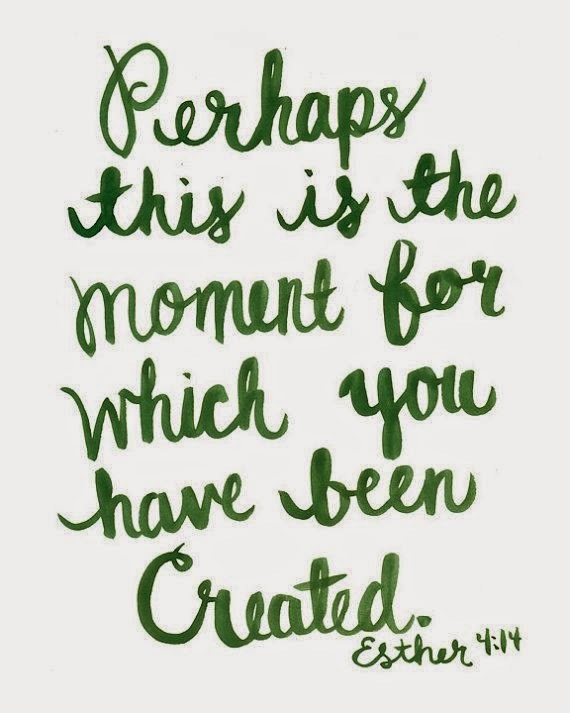 His wisdom is so great that He is able to perfectly plan circumstances far beyond what we could ever imagine. I would never have imagined that I would be dealing with infertility, or that I would have lost a baby, or that I would even be writing this blog right now. But, there was one verse in particular that stood out to me while I was reading Esther. I cannot wait to meet you one day, and read the Bible to you, and tell you all about the ways that God has shaped our lives in preparation for you! And I especially cannot wait to see what God will do in your life, and in your siblings lives! I can't wait to see the moment for which you have been created, and how God will use our children to further His kingdom! We pray every single day that you would have a passion for the Lord that is undeniable, and that you would treasure the truth of His word, in the good times, and the hard times. I love you so much! !